To ensure delivery of Olio e Limone Ristorante correspondence to your inbox, please add info@olioelimone.com to your Address Book or Safe Sender List. 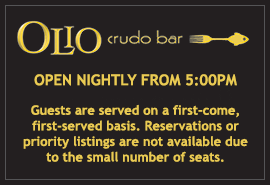 For large group dining inquiries, please submit this form to us. We will respond to your inquiry as soon as possible, normally during the same business day and within a maximum of 24 hours. Submittal of this form does not constitute confirmation of any reservations, private or group dining availability, or any type of guarantee.